In honor of this special week of Thanksgiving, where we give thanks for all we have and celebrate with food - new foods, traditional foods, and even exotic foods, perhaps...I thought it appropriate to bring in my mustard seed post. This was originally used for a food blog in a different format, so I bring you the original in all its glory. Who knows? Maybe it will inspire you to whip up a little mustard sauce or some such concoction. And as is the case with most things I start writing about, I don't really appreciate how great they are until I'm finished. So Happy Thanksgiving, and enjoy. Please allow me to introduce myself. 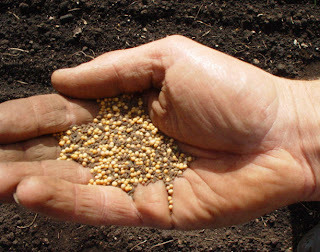 I am the mustard seed, and I come in two main types: brown- brassica juncea (pungent and heady) and yellow/white- brassica hirta (milder) the type most commonly used for the mustard you all use on your hot dogs and such. For Indian or Chinese dishes, brown seeds are what works best. The yellow is common for most dishes. In ancient times, I originated in the northern hemisphere (they don’t know exactly where, it’s sad, really). Today, I am mainly imported from Canada, and next to peppercorn, am the #1 most popular spice in the U.S. , if I say so myself. I have been around a while, I get around, and I’ve been thrown around a lot-- in a good way. The French have been tossing me into their dishes since 800 AD to spice up their meat, and the Spanish explorers took me along with them in the 1400’s to help mark their route. Pope John XXII was so fond of me, he created a new position at the Vatican, “mustard maker to the Pope.” That’s “Grand Moutardier du Pape,” to you. I also have a reputation for being an aphrodisiac, but hey, what happens in the kitchen stays in the kitchen. There’s a famous parable about me that says “good things come in small packages,” and I’m here to attest to that. I’m famous for my great healthy properties, like increasing circulation, helping digestion and respiration, and helping with skin disorders when I am in powder form, not to mention warding off evil spirits – that was for the Egyptians. I told you, I get around. You can use me whole as a seasoning for salad dressings, meat and poultry dishes, chutneys, soups, and stews. My good friend Bobby Flay has an excellent coriander and mustard seed chicken recipe, in which I am sautéed in a skillet along with white wine and coriander. Delicious. The drama really starts when you crush me. Use a blender, spice grinder, or mortar and pestle (I like this best, it feels more holistic), and mix me with a cold liquid such as water and vinegar to make a mustard paste. You can also add other ingredients such as shallots ,honey, and herbs, to flavor me. If you’re not making mustard, you can also use me as a paste or powder (just leave out the liquids) to add delicious flavor to any dish. Here’s the rub. Dry, I don’t really taste or smell like anything. Toasted, I have a nutty flavor and aroma. Crushed, that’s when my oils come out and I am hot and tangy to the tongue, with slightly horseradishy overtones. So there you have the scoop. Have a good holiday, and hey, don’t let anyone tell you you can’t cut the mustard.